This is a pre-order item. Our expected ship date is May 10. 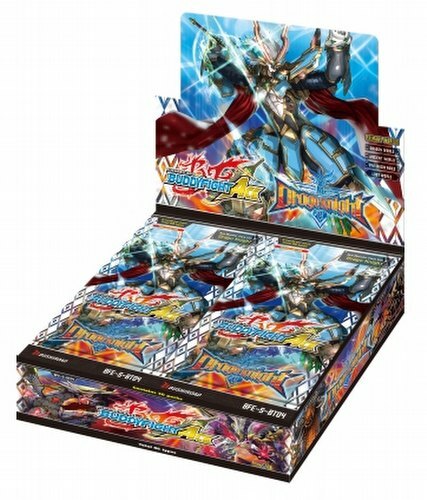 Bonus Offer: You will receive a free Future Card Buddyfight play mat with every 4 boxes of Drago Knight boosters pre-ordered. 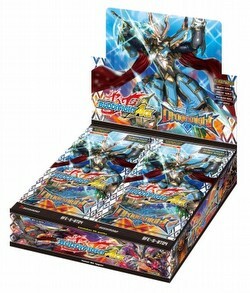 Future Card Buddyfight Drago Knight (formerly titled Deity Garga Arises) boosters include tons of new cards for popular decks. Yuga, Subaru, Masato and of course their arch nemesis, Ranma have all obtained various new powers! Their Buddies are vastly enhanced! Each booster box is guaranteed to include 1 SECRET pack. A total of 3 types of secret packs can be found. Optimize your trial deck with cards from this new booster. Play your favorite Garga in a new style. The set features cards from the Dragon, Ancient, Star Dragon, and Lost Worlds. There are 86 cards in the set - 2 BR, 4 SP, 15 SECRET, 8 RRR, 12 RR, 15 R, 14 U, and 16 C. Each box includes 30 packs. Each pack contains 5 cards, one of which is a rare or better. Parallel foils of commons, uncommons, and rares are randomly inserted in packs.